It’s been a rather blustery day. Walking along the river, I thought Roo’s buggy might just be whipped away over the edge. 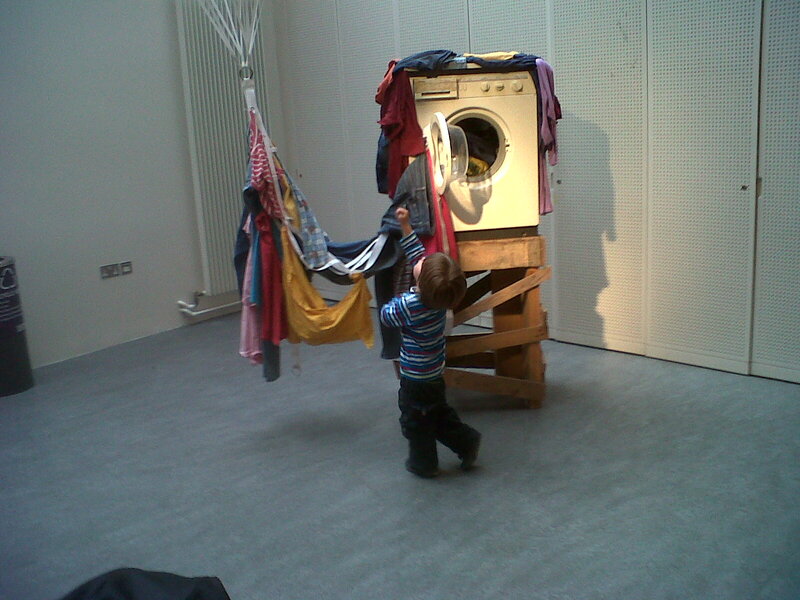 Luckily, I had Roo to use as a counterweight, so once I put him in it the problem was solved. Or maybe I was setting him up to get whipped over the edge. Who knows? 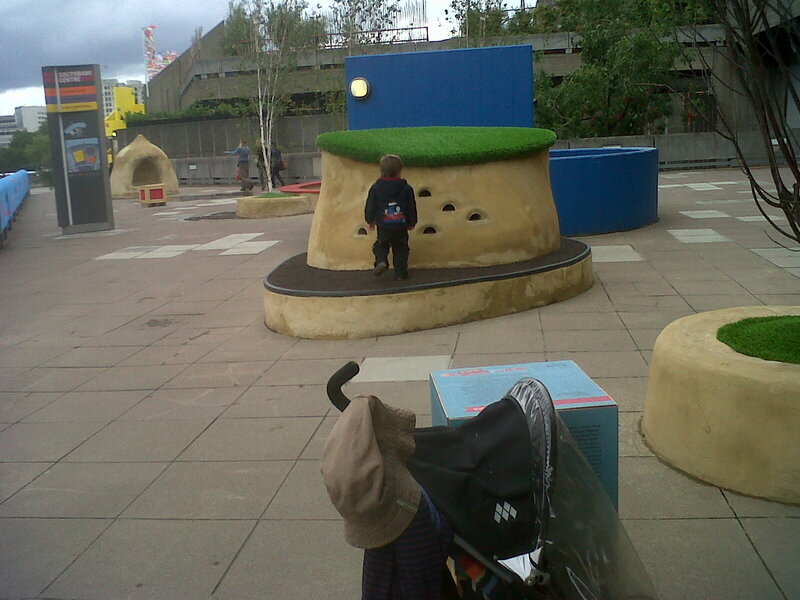 We were at the Southbank Centre to a) meet our good friends Tammy and Jake and b) check out the “Festival of the World”. My friend over at Adventures with Gravel highly recommended it and I was waiting for a nice sunny day to have a look around the outside bits. 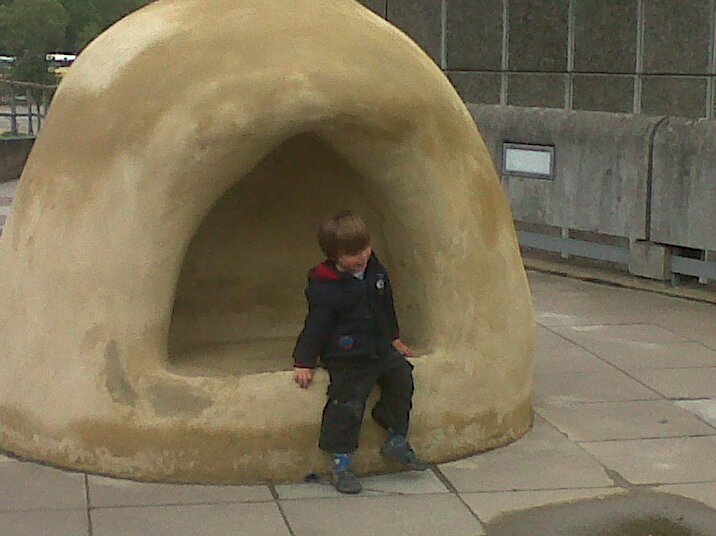 Then I gave up on the sunny day and we just took cover in the Royal Festival Hall whenever it tipped it down. Which led us to our first discovery – the Festival Museum, located on the ground floor (i.e. under the ballroom). 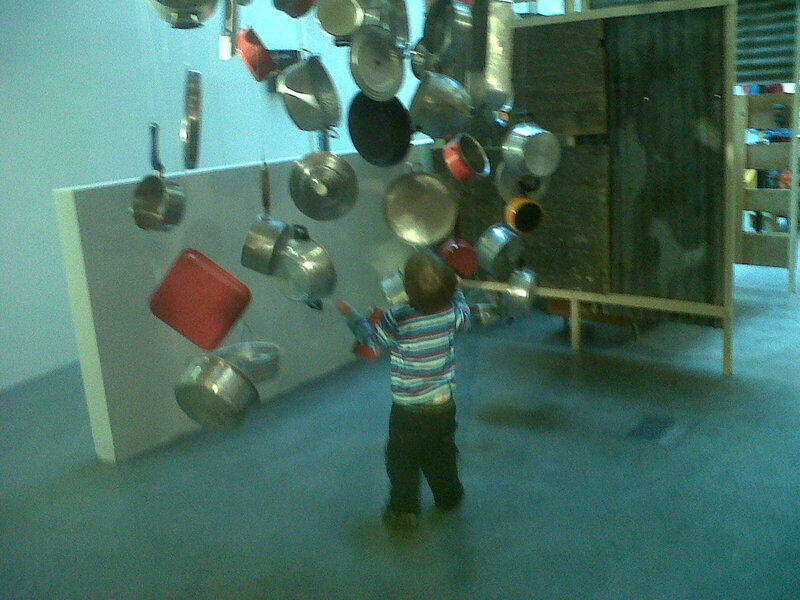 I went through it a bit quickly to really gauge what it was all about, but visually, it was great for toddlers. 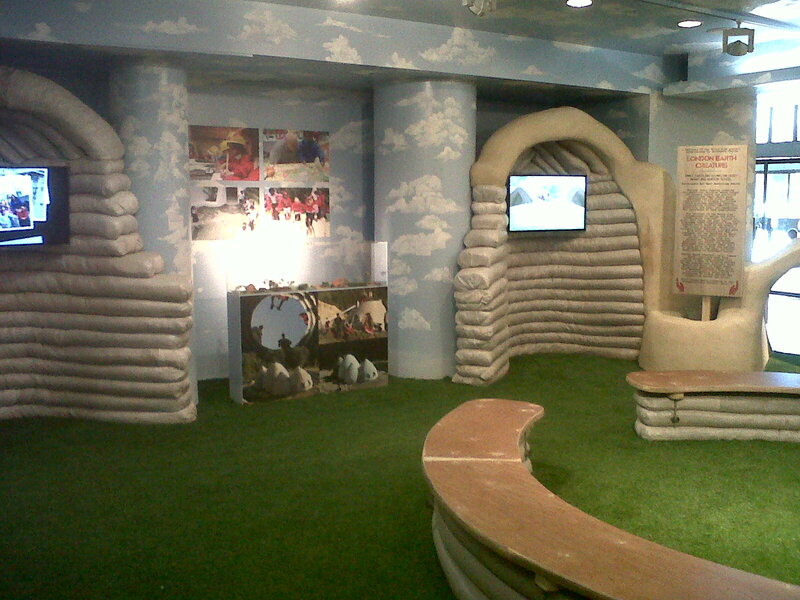 Every section had a different theme – starting with a fake outdoors (grass, sky, caves) and culminating in a passport office where you could use a computer to print your own “citizen of the world” passport. I didn’t quite have time to figure out how to do that, thanks to Roo charging off again so seems I’m not a citizen of the world. Bah.The photobooth was also out of order, which didn’t help. 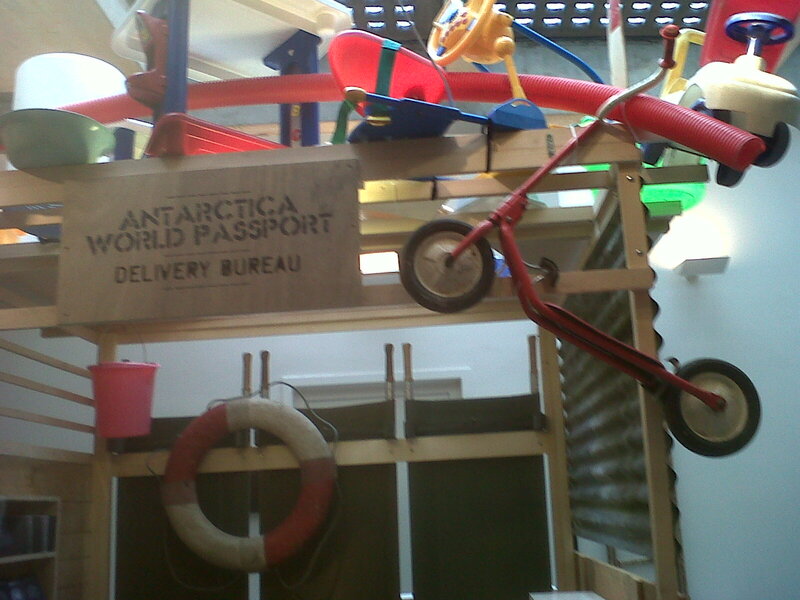 On, the upside the “passport office” was decorated with brightly coloured toys, which Roo loved, and some pots and pans on strings, which made a tremendous noise when you banged them. Which Roo did, obviously. 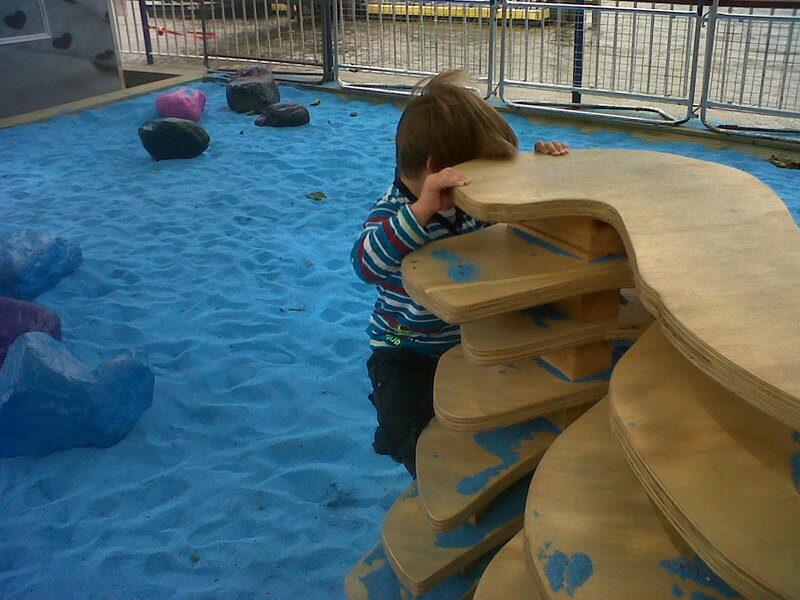 As ever, I would have liked to have looked round the exhibits and read all the displays but that is not the way of the (now) 3-year-old. So, instead here are some grainy photos. I hate my blackberry. Oh, and happy birthday Reuben. Wow, whatta lotta photos. 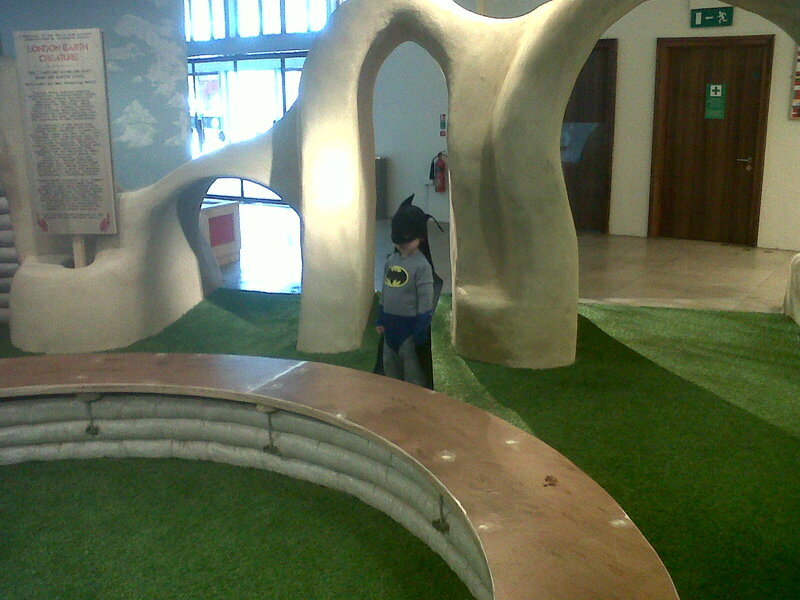 And yes, that is a tiny Batman in the last one. 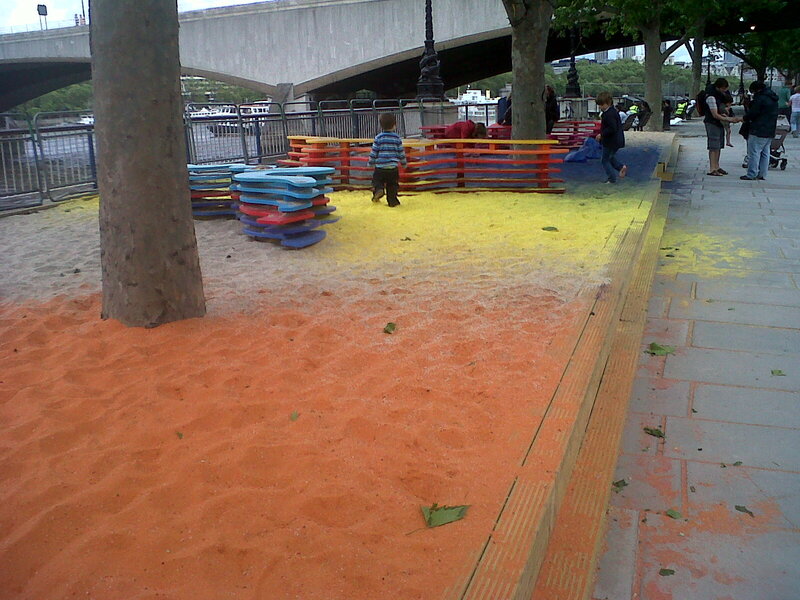 By now, the sun was peeking tentatively through the clouds, so we went outside equally tentatively, to have a play at “Rainbow Park”, the multi-coloured sand installation next to Waterloo Bridge. It was ace. 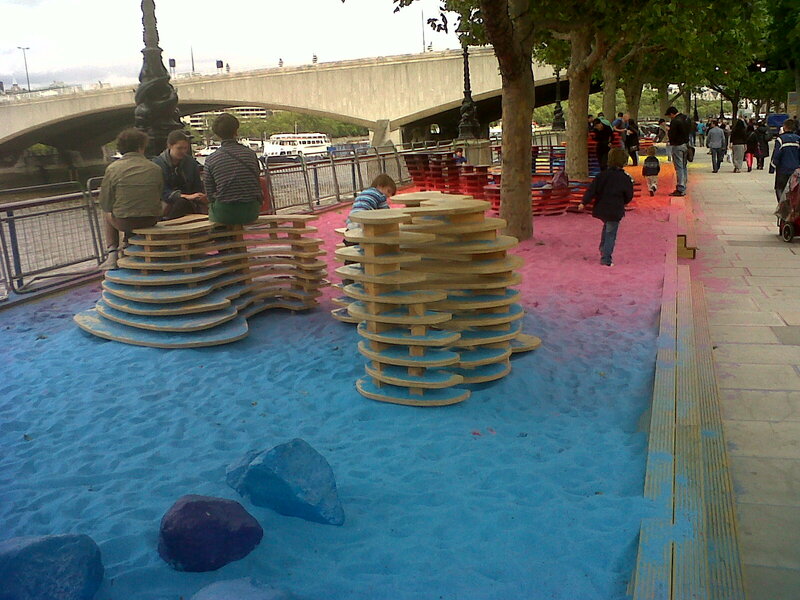 The idea is very simple – dye some sand and arrange it in roughly rainbow colour – but it mesmerised Reuben for ages. And me too. 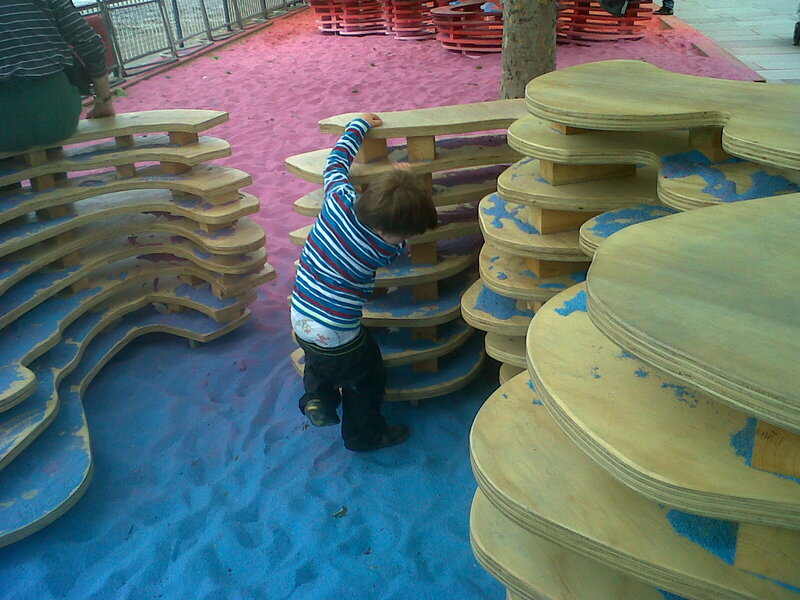 There was a mix of textures, so it felt good underfoot and there were lots of things for Roo to climb on and jump off. 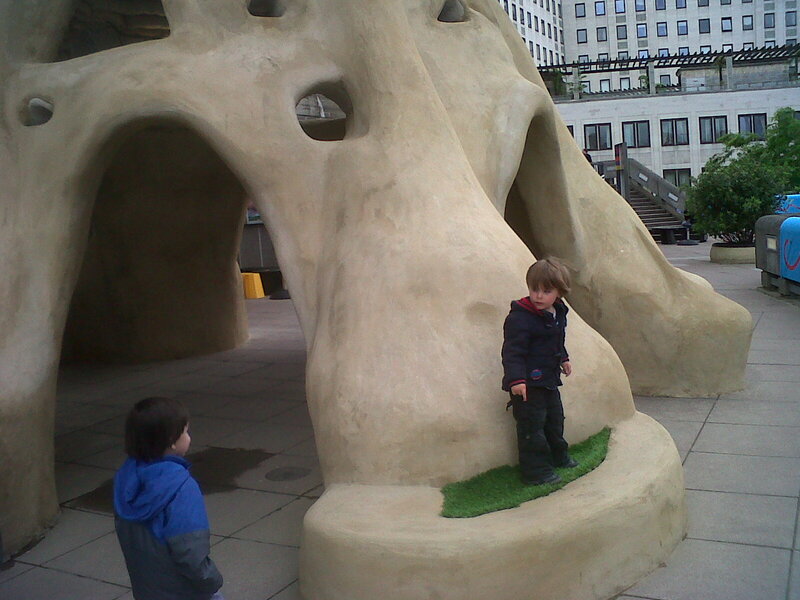 Again, pictures will explain this better…. 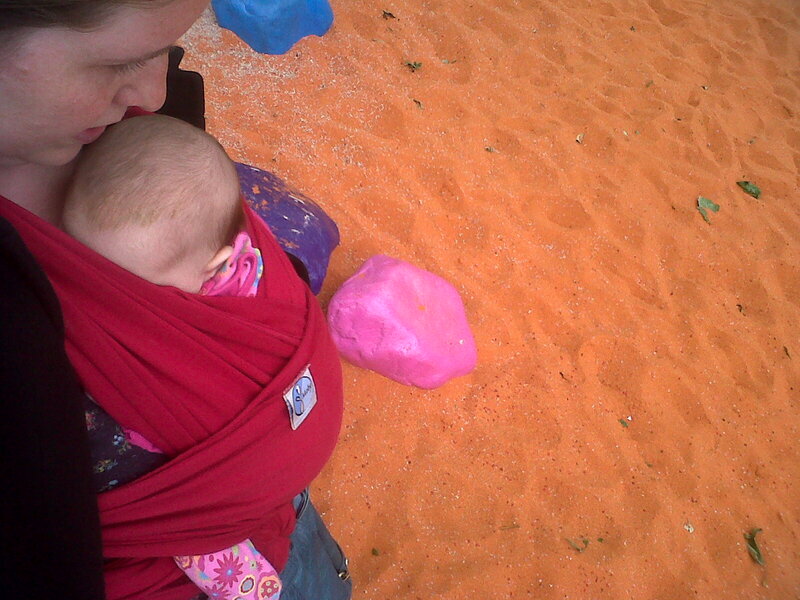 And as an added bonus, here’s a rare photo of Eva enjoying the sandpit. She loves it! 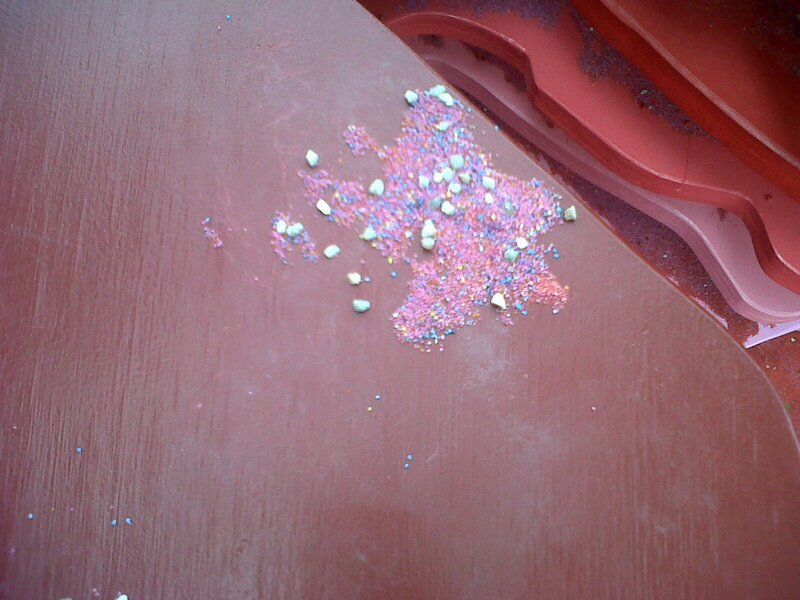 Be warned, you and your toddler will both come home with multi-coloured sand in your shoes. Be warned #2, there’s a Wahaca van serving burritos next to the sandpit and you will be unable to resist its mexican-y charm. Cash only, burritos are £6.00. Mmmmmm….! 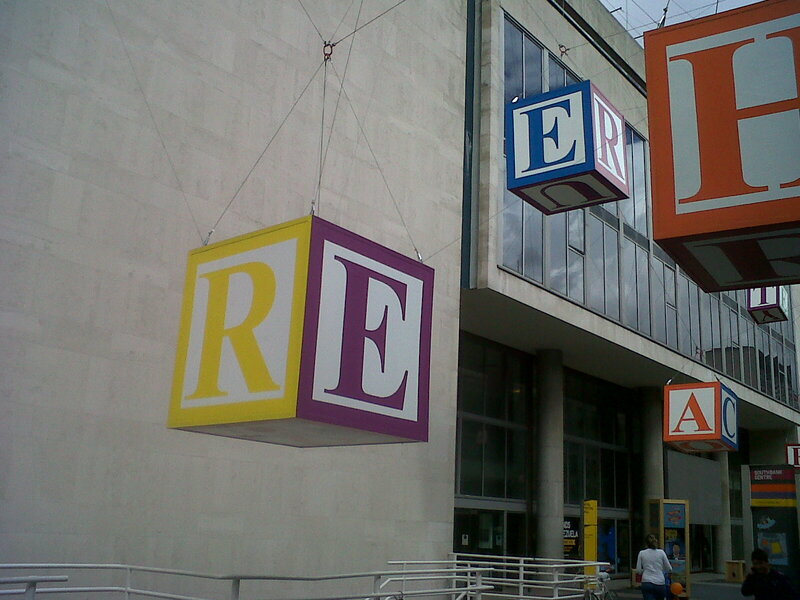 It was almost time to go home, but there was one more treat for the boys on the way, in the form of giant letters dangling from the sky on Festival Terrace. 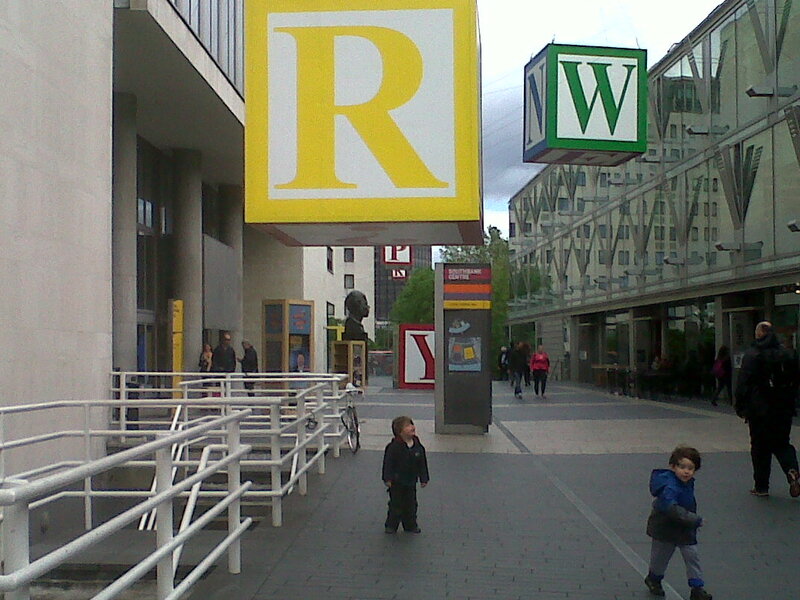 I persuaded Roo to pose under an “R” but you can’t really tell it’s him. 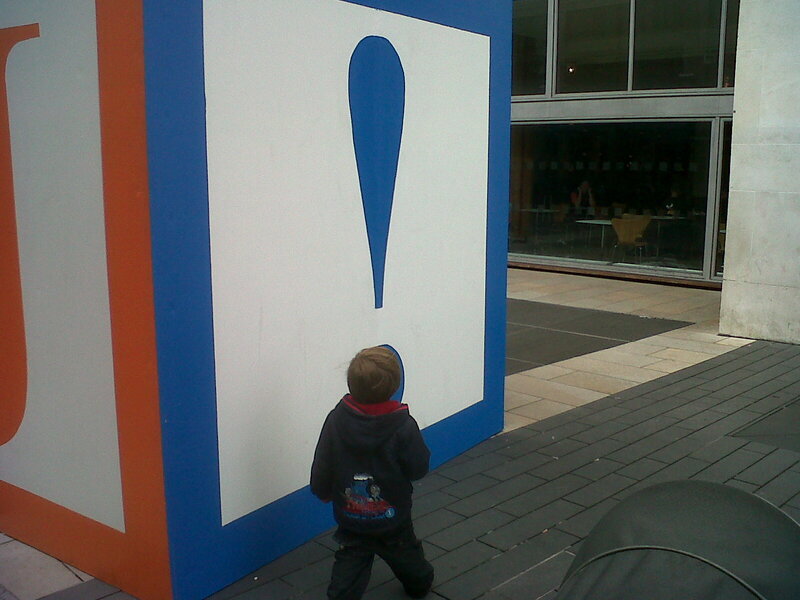 Jake was initially disappointed, until the last cube turned out to have a huge “J” on it. Eva refused to pose at all. Apparently, they spell out messages if you look at them from certain angles but I couldn’t really see it. 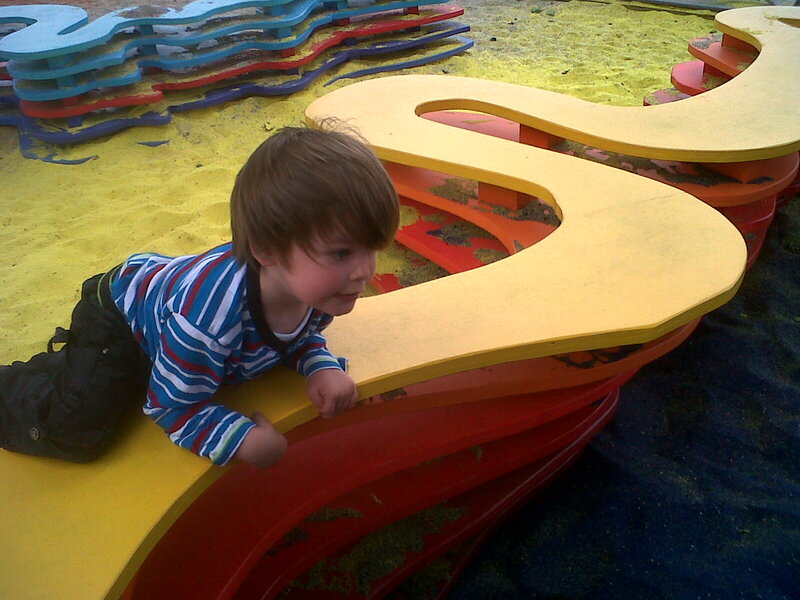 Ah well, Roo can’t read yet so we could tell him it said anything. 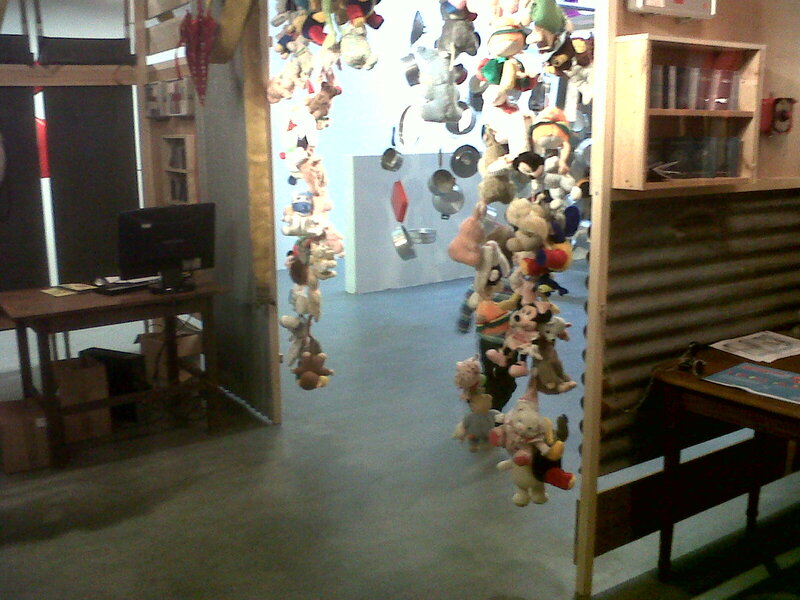 If only I had a shot of Roo and Eva dangling off either side of that R/E cube, life would be perfect. Oh yes. But it’s not, so instead I got conned into buying Roo a ridiculously expensive croissant from Le Pain Quotidien. Everything on the South Bank may be free, but with all the yummy food available it could end up bankrupting you. 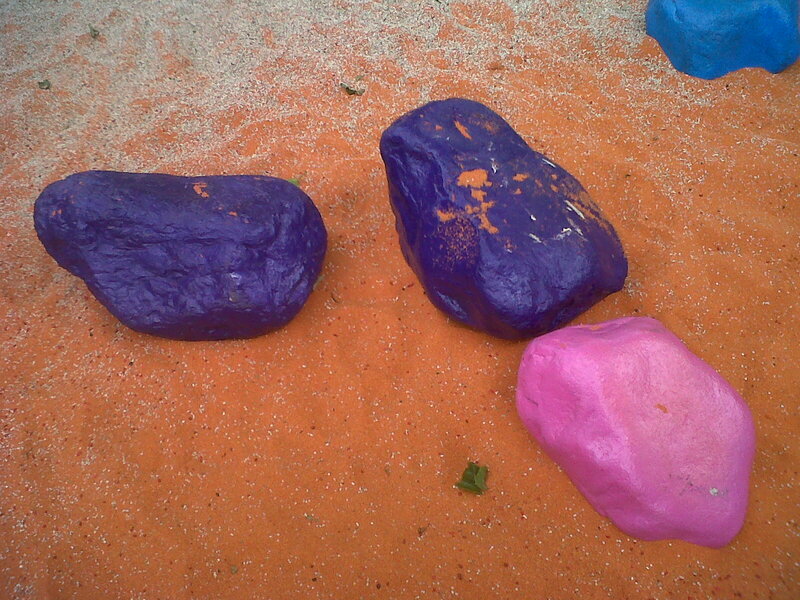 This entry was posted in Creating precious childhood memories or something (days out) and tagged rainy day places, sandpits, South London. Bookmark the permalink. I sooo wanted a burrito, I’m jealous! No cash 😦 Glad you enjoyed it, and yes, the nappy change at Roo’s party was mostly blue sand. That stuff gets everywhere. Had no idea there was a museum under there! Will be popping in next time! Was it free? yes! I don’t often go places that aren’t free….